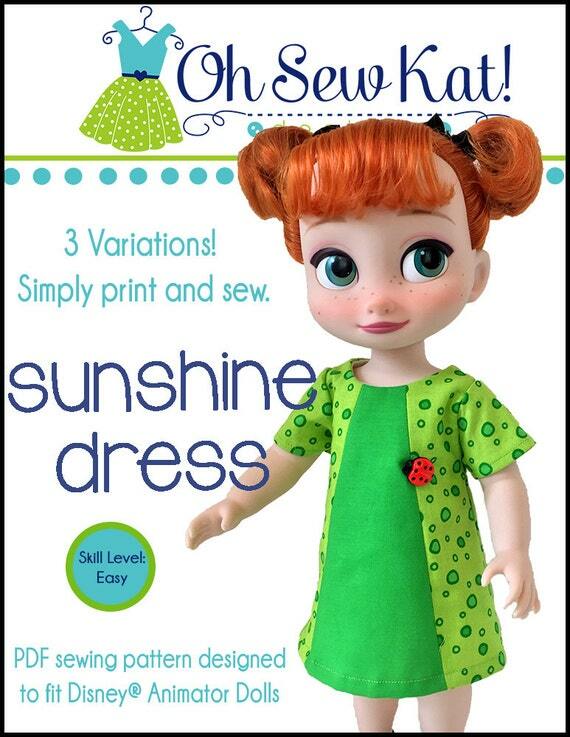 Sewing Pattern for Dolls – Oh Sew Kat! 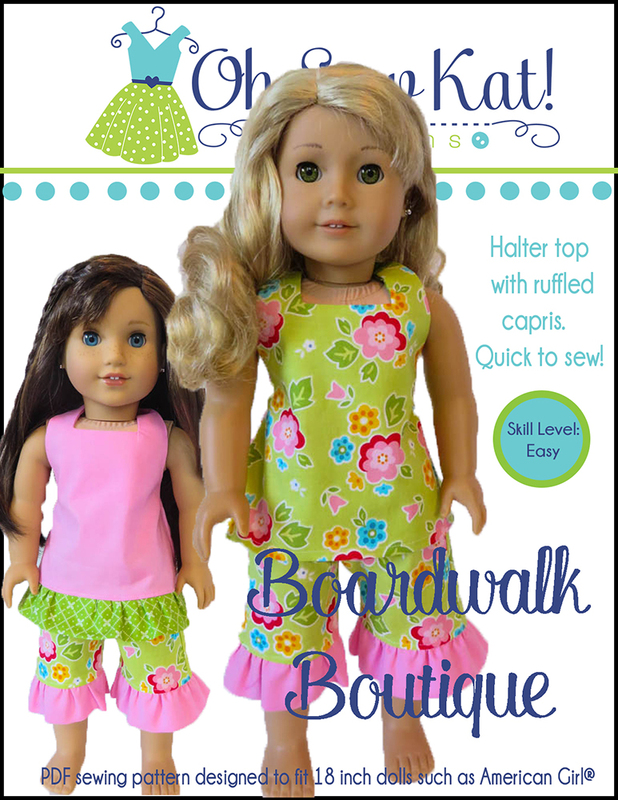 Make Irish themed doll clothes for your 18 inch Doll with Easy Sewing Patterns from Oh Sew Kat! March is coming in like a lion! 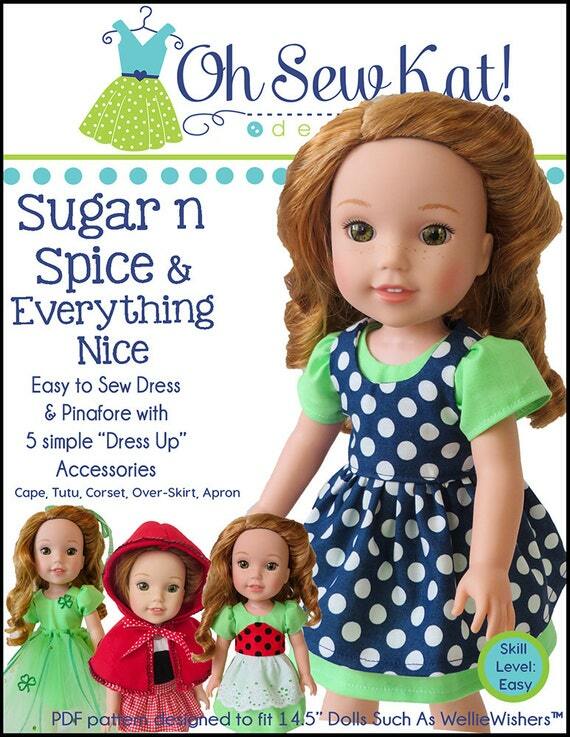 As we head towards spring and warmer weather, it’s the perfect chance to pull out your greens and stitch up a festive outfit for your dolls with easy to sew, print at home PDF sewing patterns from Oh Sew Kat! Here are a few of my favorite Irish themed outfits for Dolls. All of these patterns are available in multiple doll sizes in my shops. Click the link above to shop the complete collection. Because the shamrock season isn’t quite as long as some of the December holidays, I tend to choose quick patterns that use very little fabric, or mix and match pieces that can work all year, but just add a seasonal component. 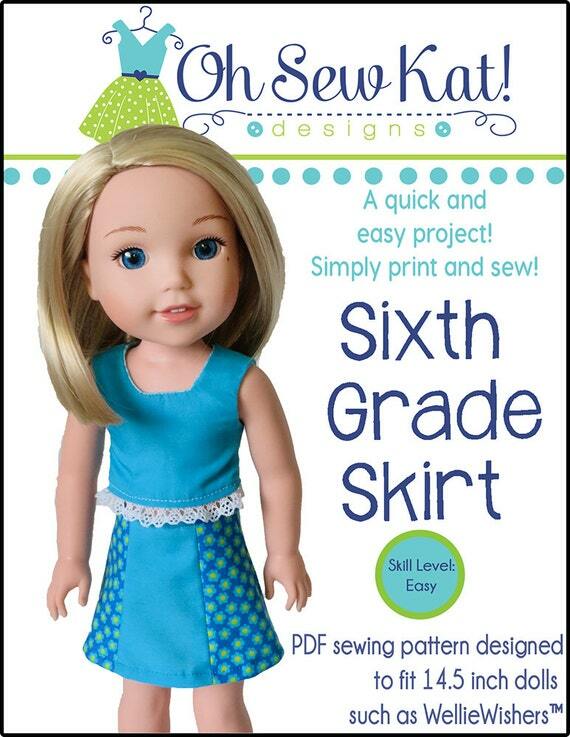 Sixth Grade Skirt and Playtime Peasant Top It just doesn’t get any easier than this. Download and stitch an outfit up today! Four Season Skirts & Popsicle Tops: Add a turtleneck shirt made with the Jumping Jack pattern to a top normally made for the summer outfits, and try the free skirt pattern. Party Time Peasant Dresses are always a favorite. See more of this dress, along with a cute overdress for it HERE. The Sugar n Spice and Everything Nice also makes a beautiful (and easy!) Irish princess! Don’t forget to pin these images for later! 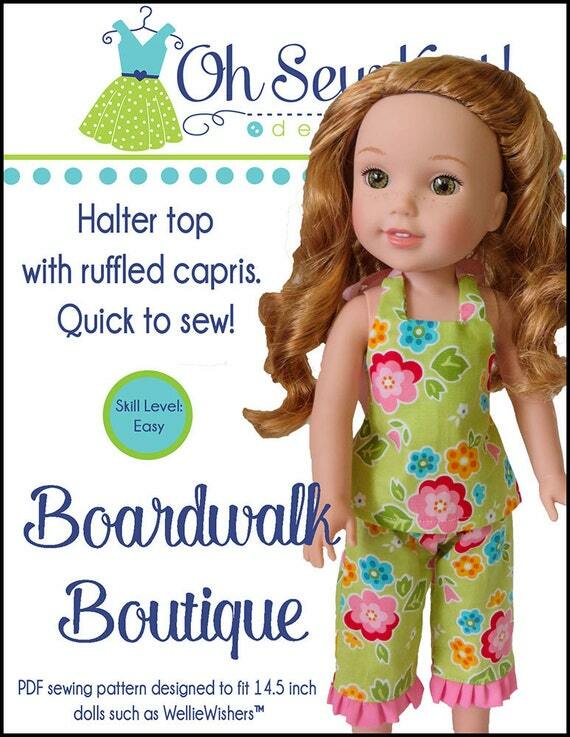 See more ideas for clothes for your 18 inch and other sized dolls in the INSPIRATION GALLERY. 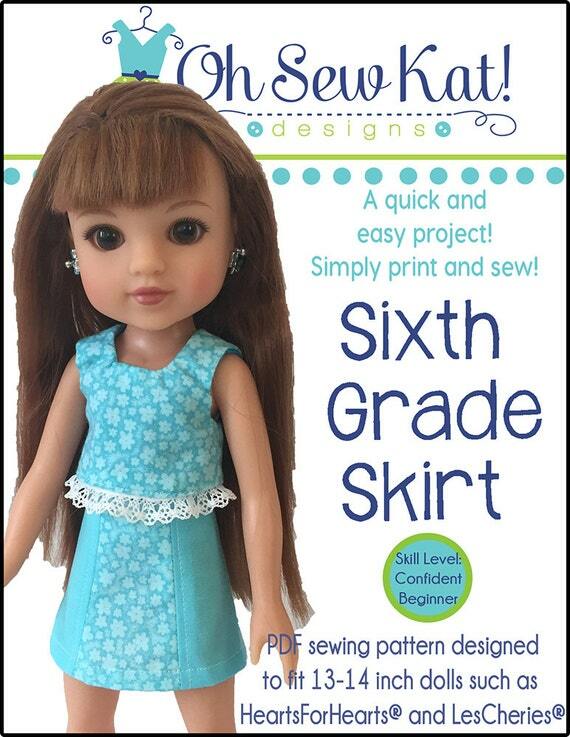 Are you on a tight budget when it comes to doll clothes for your 18 inch dolls like American Girl®? When my daughter was growing up, I know I sure was. The outfits at the store are super cute, but wow, do they add up quickly!! 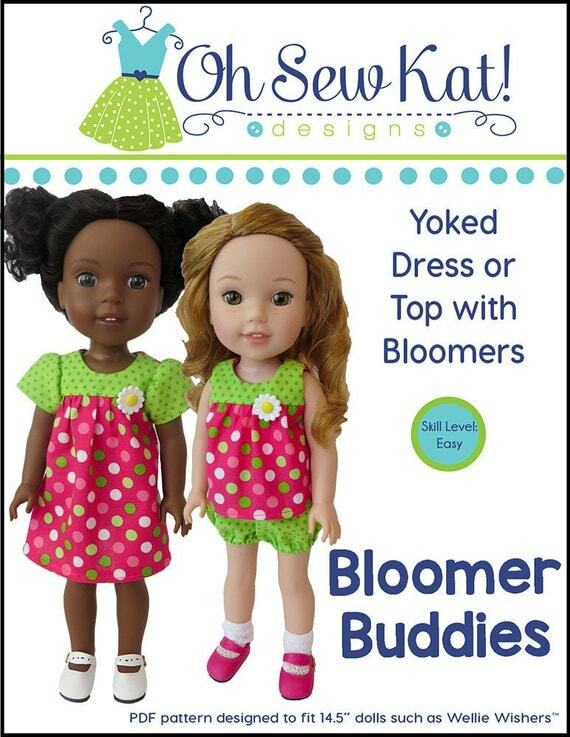 My daughter really enjoyed planning her own doll outfits, and from this love and process, Oh Sew Kat! Patterns were born. As you wander through Walmart for this or that, be sure to stop by the fabric & craft sections! You can find these darling packs of fabric (called Fat Quarter Packs, which means each piece in the pack measures 18×22 inches.) for just $3.97. You read that right! That is a full yard of fabric for under $4. PS. They also offer bundles with bunnies!! See the dresses I made HERE. Here are two outfits I made from just one of those packs…and I still have a whole lot left to go! That means at a MINIMUM, each dress was only $2. I still have almost the whole piece of the red polka dot (enough for another bib or easy up jumper– maybe some Playground Pants?) and a few scraps from the other three. That could mean 3 outfits total for just $4! Wow!!! 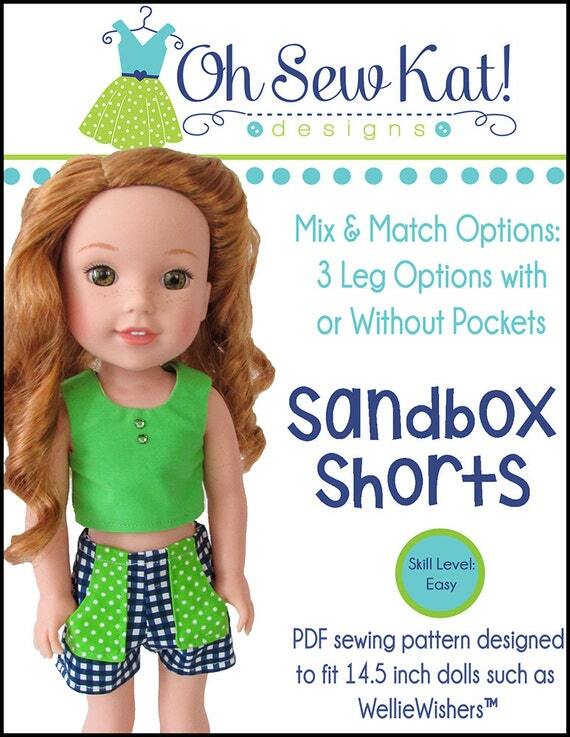 Yes, you do have to add the cost of the PDF sewing pattern- but at $4.99, or even $5.99, you can still consider the outfit less than $10. And the best part? 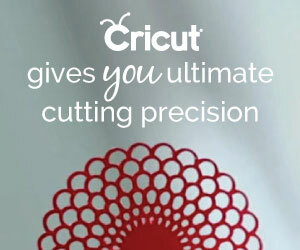 You can use the pattern over and over again, reducing your cost each time you do! And without any bothersome tissue to lay out, cut out, fold up (only to rip each time you pin! ), your print at home PDF patterns live safely inside your computer and your etsy (or other) accounts until the next time you need them! 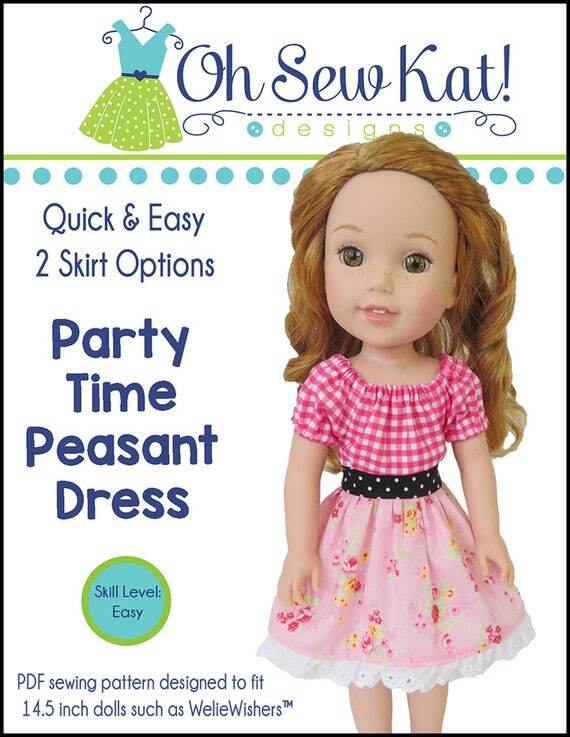 The Party Time Peasant Dress is my absolute favorite for any holiday dress. I love the accents, the ease, and the full skirt! The top and waistband take inches of fabric. The problem with fat quarters is the skirt. Anything over 22 inches (remember, this was a fat quarter of fabric), has to be pieced. My answer to that seam was to offset it from the middle, and accent it with pretty bows! I also considered red heart buttons! I trimmed the hem with a gingham bias tape trim… easy and cute!! And cute for Blaire too!! The next pattern I turned to is the Backyard Bibs. This quick and easy overalls dress takes very little fabric, very little time, and looks adorable over the Playtime Peasant Top, which can also be used with other outfits. Cue the cute heart buttons for Kailey! Find these patterns in a special bundle value HERE. 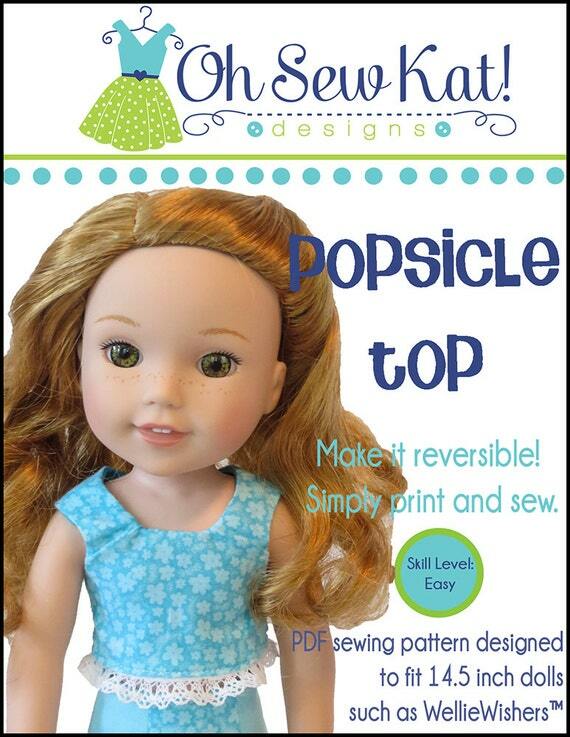 This pattern is also available for 14 inch dolls like Wellie Wishers! Be sure to PIN these images for later!! 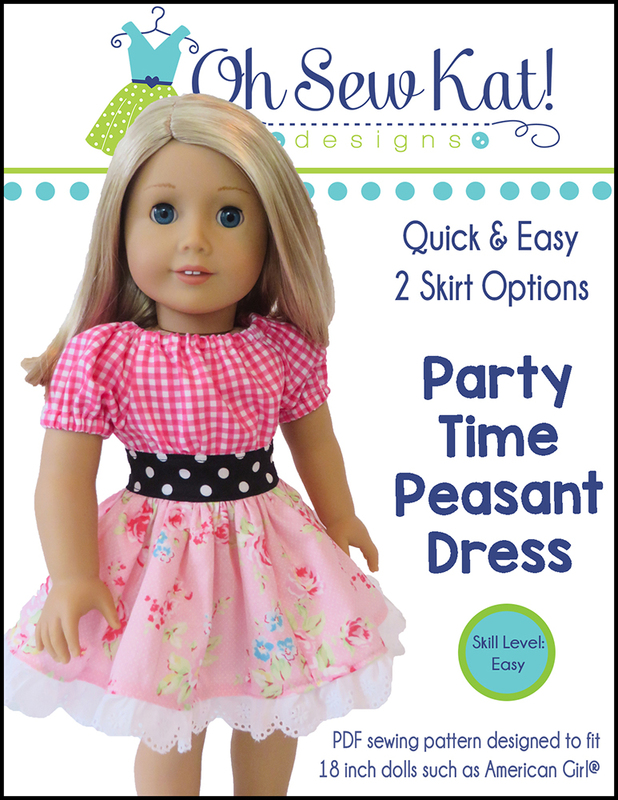 Check out the Party Time Peasant Dress and Backyard Bibs pinterest boards today! Don’t forget to like this post and follow me on Pinterest! Welcome back to Oh Sew Kat! 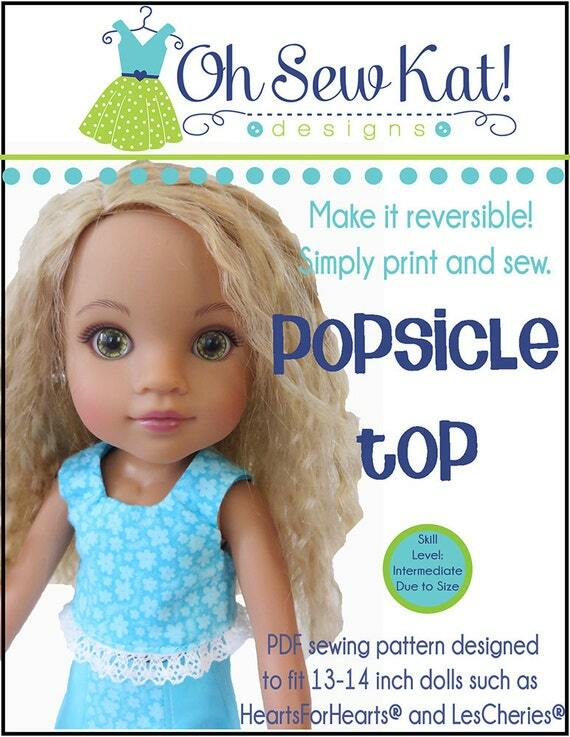 Your one stop shop for PDF sewing patterns for your dolls. I’ve been playing around with my Valentine fabric…and came up with this super cute dress for the new Girl of the Year, Blaire Wilson, who just joined our family this week! 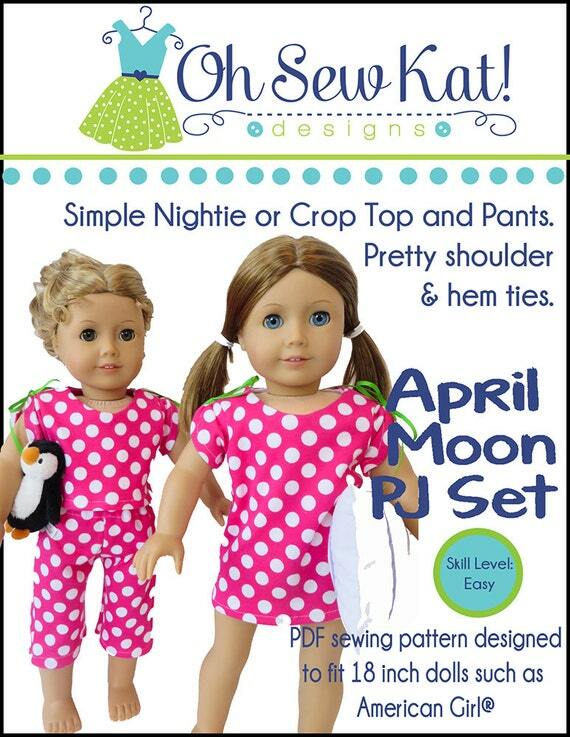 See more sewing pattern for 18 inch and other sized dolls in my Etsy Shop! 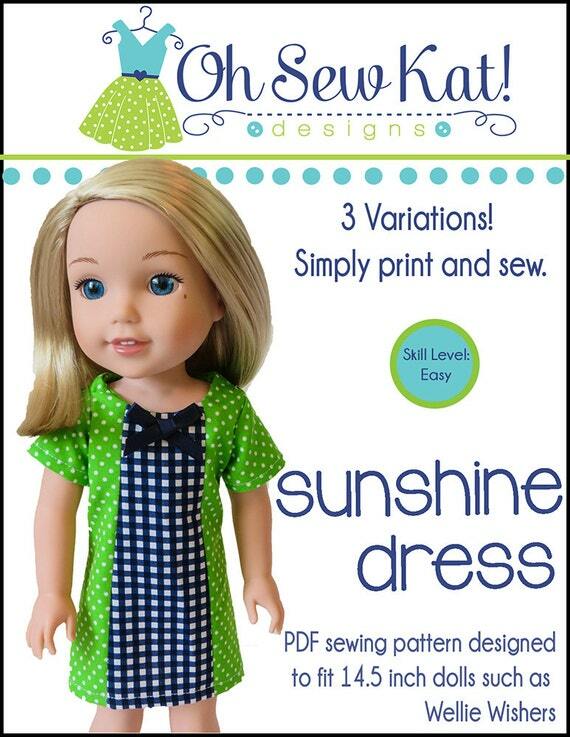 This cute dress was made using the School Bell Blouse pattern. Read more about the pattern HERE. First, you will need the pattern. 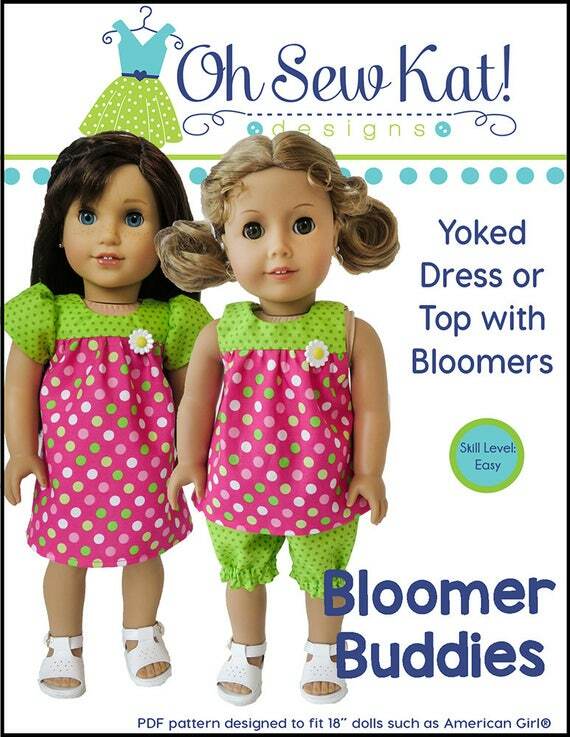 Click the photo to purchase this pattern for 18 inch dolls, 14.5 inch dolls like Wellie Wishers™ and Glitter Girls®, and 16 inch Animators’ princess dolls. This dress is made from View B, or the School Bell Blouse with the peplum., shown in green on the right on the pattern cover. You don’t even need to make very many changes to turn this cute top into a fun dress! Click here to see another tutorial to make a dress using view A. You can make so many different tops and dresses from just one pattern! Print out your pattern pieces. Measure up one inch from the bottom of the bodice front and back, and cut on this new line. This will make the bodice more of an empire waisted dress. You can also leave this piece as is and keep the waistline at the natural waist. Do not cut the peplum out. Instead, cut a “skirt” piece that measures 7 x 36 inches. Finish one long edge, and press up 3/8th inch. Stitch the hem in place. Follow the pattern as directed, using your gathered skirt instead of the peplum piece when you come to that step. Finish your dress with a pretty bow, or sparkly belt. Use ribbon, fold over elastic or other fun trim. I used some glitter trim I found at Hobby Lobby and added velcro to the ends like a belt, so I can use it with other outfits too! 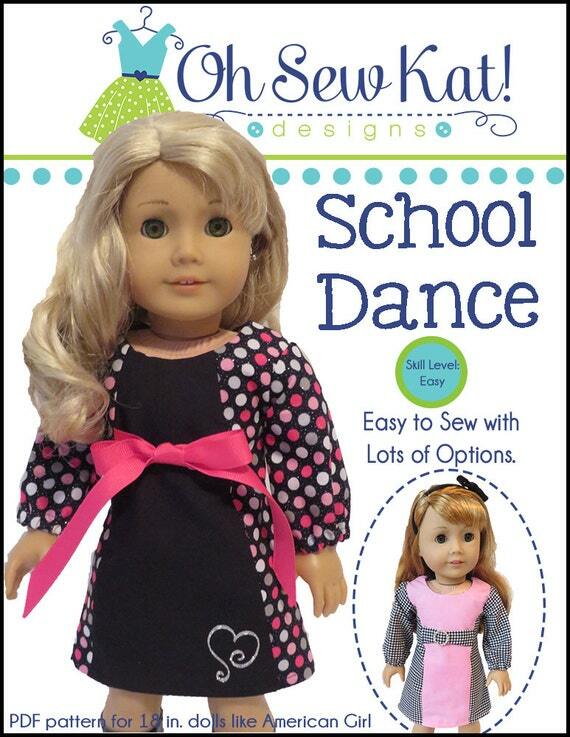 Make a dress for your 18 inch doll with the School Bell Blouse sewing pattern. 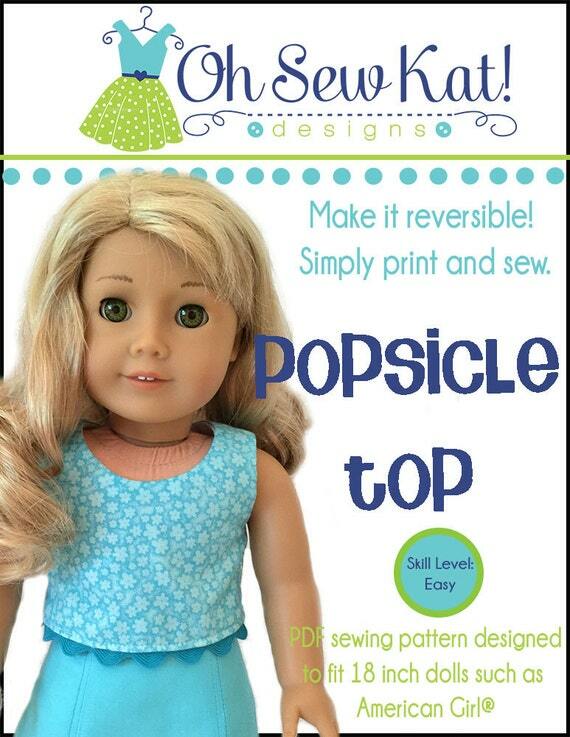 There are lots of ways you can sew this one, simple pattern in order to create a look that is as unique as your doll is. Find other ideas for the School Bell Blouse pattern here and here.